the mentor would increase (within the context of the music industries) the confidence, competence, and breadth and depth of contacts of the mentee, appreciably and measurably. The project presented a great many unique opportunities for Kathrine, as well as its share of challenges. Our feedback showed that the Westminster workshop created a safe and friendly space for ten young women to freely ask questions of their peers – an environment which was extended into a group dinner in the evening – and allowed them to forge friendships and alliances which endure to this day. The Great Escape Festival and Convention was easily the most challenging of the field trips, with meetings conducted in loud and hectic places; in cafes and bars, in the street, and in venues, with those from different countries or regions of the UK. Different accents and dialects competed with the noise, and those who speak English as a native language are rarely cognisant of the need to alter their pace of speech, their diction or vocabulary around those who – despite being fluent – may not be as fluent in the lexicon of the music industries, their myriad slang words, acronyms, technical jargon and ‘marketing-speak’. As someone with a speech impediment (a covert stammer, described here), Andy was conscious of his own challenge to communicate effectively with Kathrine, particularly in such unpredictable surroundings. It’s safe to say The Great Escape presented itself as something of a ‘baptism of fire’ for Kathrine, but one that will have left her in no doubt about what to expect at similar events around the world which – if her artist is to find success – she’ll most likely need to attend. Both the London and Berlin field trips were far more relaxed and allowed them to sit one-on-one with some of Andy’s contacts in different sectors, to hear about their companies, the roles they played within them, and how they got to where they are. Andy secured two Artist Liaison roles at the UK’s End of The Road, a three-day festival in the southern English countryside with a capacity of 16,000 per day. They arrived early each morning, assisted with the site build, including preparing backstage rooms for artists’ arrival, running or driving equipment, supplies and personnel around the site, driving off-site for supplies and generally being available for whatever the festival management needed help with. Once the festival opened this work continued, and their designated Artist Liaison roles began; looking after the needs and well-being of artists and their crew, while operating as part of a large team of staff across multiple stages, throughout long days and nights. Kathrine was able to see the inner workings of a music festival from a perspective rarely seen or appreciated by an artist manager, deepening her understanding of the terrain, and again allowing her the opportunity to strike up friendships and acquaintances with people from all corners of the industry. 1) The social skills you need in a business like this. Being at The Great Escape and meeting lots of professionals and very competent people definitely helped me improve here. I’ve always loved meeting new people, having good conversations, but this is on another level. You meet so many people over such a short period of time, and sometimes it’s hard to follow. But that definitely improved, and I used what I learned on other showcase festivals and in meetings. 2) The second thing is how we can make each other better. At University of Westminster I got to meet other young women entering the music industry, and it was inspiring to see how much knowledge they had, how we could share our experiences and learn from each other. 3) There is no right answer for any situation… ever! You can look at other artist managers and see what they did to solve a particular case, but the circumstances will never be the same, so you really have to be creative and do things your own way. I’ve come to realise that this is actually very liberating, and it gives room for new thoughts and ideas. I am so grateful that I got the opportunity to learn from Andy, who has so much experience in the industry, and I am very excited to continue on this path. The project arrived at a time where I was struggling to find something practical to do that would have a real, physical impact on the career of a young manager. It’s easy to shout about how women are woefully underrepresented at all levels of every sector of the music industry (and I do plenty of shouting about it); less easy to actually do something that has a chance of effecting positive and lasting change. It helped that I was inspired by the focus, determination and talent of both Kathrine and her band Oakland Rain. In fact I’d say it was crucial to the success of the project. I’d love to do it again, but it’s not so easy to find a manager I can work with and her band be one that I can feel proud to stand next to. 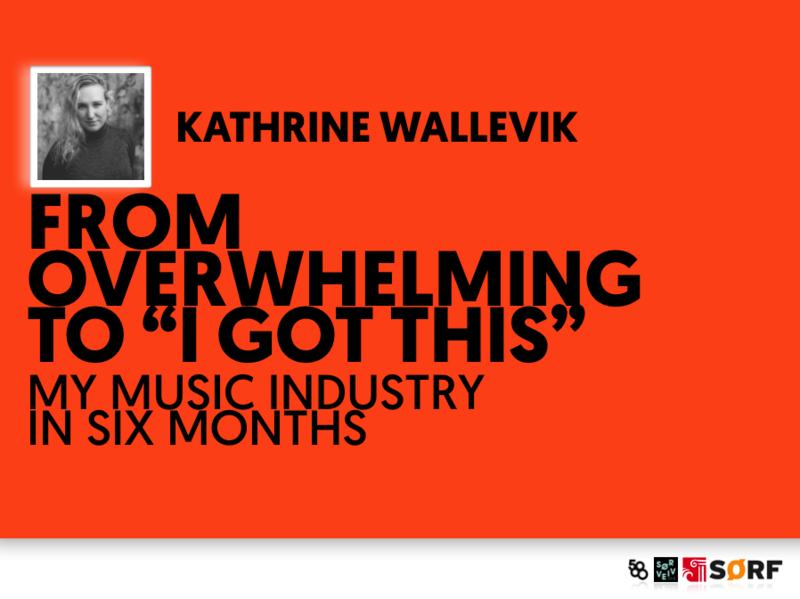 The project successfully pursued three goals: (1) by positioning Kathrine Wallevik in a business that places a premium on personal relationships and merits, (2) by presenting a better understanding of the changing conditions for the music manager and (3) by focusing on gender-barriers in the music industries. Through cooperation with Andy Inglis on the practicalities of networking and understanding the music industries, and with Sally-Anne Gross and the University of Westminster, the project attained all its goals for Kathrine Wallevik and Oakland Rain, as well as adding to a larger body of research initiatives concerning gender issues in the music industries. The project applied an interesting and unorthodox approach, and illuminated the potential for further developments and research, some of which are being followed up by Sally-Anne Gross and the University of Westminster. Through the collaborative nature of the project, the links between University of Westminster and University of Agder have strengthened, as has the likelihood of a collaborative approach on larger research projects in the future. All costs of the project were met by the funds supplied. Kathrine took receipt of 100% of the funds and paid all costs: transport and accommodation for her and Andy, Delegate passes at The Great Escape, dinner after the London Workshop, any and all costs incurred around meetings (coffee, tea, lunch, dinner) in London and Berlin, and car hire, fuel and accommodation at End of The Road Festival. Andy was paid a salary of approximately 7,000€ (1,166€ per month) for the design, planning, logistics-handling, delivery and in/post-project mentoring.